Carl Andersson joined the division in early 2017. He is working on the Levitate project. The goal of the project is to levitate particles using ultrasound and creating haptic feedback at the same time, as well as audible sound. This would create interactive acoustic holograms using small plastic beads as pixels. 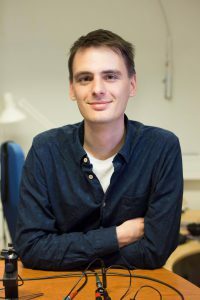 The project is a joint effort between Chalmers University of Technology, University of Glasgow, Aarhus University, University of Sussex, and UltraHaptics Ltd.
Carl is also working with 3D audio, mostly on signal processing of sound fields recorded with spherical microphone arrays.